Practice Instrumentation Transducers questions and answers for interviews, campus placements, online tests, aptitude tests, quizzes and competitive exams. This set of Instrumentation Transducers Multiple Choice Questions & Answers (MCQs) focuses on “Fluidic Systems”. 1. What is the analogous quantity of current in the fluidic system? Explanation: Flow rate of a fluid in a path is analogous to current flow in a conductor and both can be treated as analogous quantities. 2. Which of the following device cannot be used for measuring the pressure of a liquid? Explanation: pH meter is used for measuring pH value of a liquid, all other devices are used for measuring pressure. 3. In laminar flow pressure changes are maximum. Explanation: A liquid is said to be in laminar flow if its pressure changes are minimum, otherwise it is said to be in turbulent flow. 4. Which of the following represents liquid manometer? Explanation: From the transfer function of a liquid manometer it is clear that it is a second order system. 5. What is the advantage of the pneumatic system over the hydraulic system? Explanation: The advantage of pneumatic system is that gases show high compressibility which uses minimum space for a volume same as hydraulic system. 6. Which of the following represents liquid manometer? Explanation: Value of damping factor in liquid manometer is far below one and the system represents under damped system. 7. Which of the following represents hydraulic capacitance of manometer? Explanation: ΔV is the incremental change in volume and ΔP is the incremental change in pressure. 8. Which of the following is not a scalar quantity? Explanation: Force is a vector quantity and all other mentioned quantities are scalar quantities, which have magnitude only. 9. Which of the following is used to represent a difference in pressure between absolute zero and atmospheric pressure? Explanation: Difference in pressure between absolute zero and local atmospheric pressure is known as gauge pressure, whereas differential pressure is the difference of pressure between two medium. 10. What is the equivalent pressure in Pascal for 1atm pressure? Explanation: Pascal and atm are two different units used to indicate pressure values. 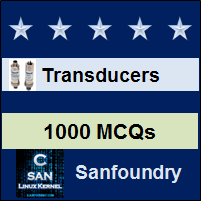 Sanfoundry Global Education & Learning Series – Instrumentation Transducers. To practice all areas of Instrumentation Transducers, here is complete set of 1000+ Multiple Choice Questions and Answers.